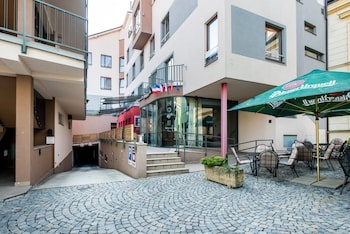 Located in the heart of Uherske Hradiste- this hotel is within a 5-minute walk of Dolmen Gallery and Slovakian Theatre. Stadion Ludka Cajky and Kyjov Stadium are also within 20 miles (32 km). UHERSKE HRADISTE (Station) is only a 5-minute walk. Free underground parking. Free garage. Nice city. Friendly staff. Good English-speaking staff. Bathroom well-equipped. Big shower. Nice room.